The porcelain veneers procedure is one of our most popular cosmetic dentistry solutions. The Fawcett Center for Dentistry has helped numerous patients achieve their dream smile through this method of aesthetic enhancement. Porcelain veneers can be a highly beneficial solution for those wishing to correct minor imperfections or improve the appearance of their smile. Our experienced cosmetic dentist in Houston, Wayde Fawcett, DDS, provides natural-looking, custom-designed veneers for patients who prove to be good candidates for the procedure. When Should Porcelain Veneers be Considered? Porcelain veneers are thin shells of ceramic material that are custom-designed and crafted in a dental lab. These translucent and extremely natural-looking restorations are bonded to the front surface of a tooth to help correct or improve smile imperfections. Dental veneers are categorized as a cosmetic dentistry treatment and have helped many individuals dramatically improve the appearance of their smile. Porcelain dental veneers create teeth that are beautifully shaped, aligned, and white. They are used to close gaps between teeth or to restore and protect teeth that are worn, chipped, or uneven. Porcelain dental veneers are also great for whitening teeth that have permanent stains, or teeth that have darkened naturally with age. During your initial consultation, Dr. Fawcett will evaluate your teeth and talk with you about your options. If you are an ideal candidate for porcelain veneers, he will create a customized treatment plan designed to address your concerns and renew your smile. What Are the Benefits of Porcelain Dental Veneers? Gives a more youthful, healthier smile. Patients can look 10 -15 years younger. The porcelain veneers procedure begins with the preparation of the affected tooth so it will properly accommodate the veneer. Some removal of the original tooth structure will likely be required in order to provide the best fit, function, and appearance; however, Dr. Fawcett takes a very conservative approach and strives to provide as minimal alteration to the tooth as possible. Next, a dental impression of the teeth will be performed. The impression will serve as a precise blueprint for the design of your veneer. Once the veneer is manufactured, it will be delicately placed on the tooth with a strong dental cement and adjusted to create the best possible functional and aesthetic results. The veneer is color-matched to surrounding teeth for a seamless blend. Once the veneer is given a final polish, the procedure is complete. Does the Porcelain Veneer Procedure Hurt? Local anesthesia is typically used during the procedure to help limit any discomfort. Dr. Fawcett also offers sedation dentistry to help patients suffering from dental anxiety feel more relaxed. Although our porcelain veneers are relatively strong and durable, care must be taken to not damage or break the thin porcelain shells. If you have a tendency to grind your teeth, the doctor may recommend a protective guard to be worn while you sleep. Veneers provide more strength when crushing an object than twisting or tearing. Therefore, just as with natural teeth, patients with veneers should avoid opening nut shells, chewing on bones, ice cubes, or anything else that may cause chipping or cracking to occur. Good oral hygiene will ensure your veneers stay strong and your gums stay healthy and provide you with a long-lasting, attractive smile. It is important to brush and floss regularly. Yes. When you undergo the porcelain veneer procedure at our practice, you can expect to leave our office with a restoration that has been specially designed to match the rest of your natural teeth. Porcelain veneers are known to be a long-lasting cosmetic solution. They are made with a porcelain material and are attached the front of your teeth to last for several years, if not decades! Porcelain veneers procedures are customized for each patient; therefore, the price of the veneers treatment will not be the same for everyone. On average, the cost of porcelain veneers typically falls in the $1,000 to $3,000 range. With that in mind, numerous factors are taken into account that will affect the final total. These include the type and number of veneers being fabricated and placed, the required amount of preparation and alteration to the original tooth structure, and other associated expenses. Once your customized porcelain veneers treatment plan is developed at the initial consultation, a member of our friendly dental team will calculate an estimate of the total cost—which will include all aspects of the procedure—and answer any questions you may have. Our practice accepts an array of convenient payment methods, and we work with reputable companies such as CareCredit® and Wells Fargo Health Advantage®. These agencies offer affordable dental financing plans for eligible applicants who would like to pay for their treatment on a monthly basis. 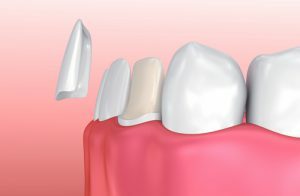 It is important to remember that dental rehabilitation is a complex process involving the skills and expertise of science and artistry, and that the fees charged reflect the technical and artistic skills of the dentist performing the procedure; the type of material being used; and the technical skills of the ceramist making the veneers. Dental veneers are a beautiful, natural-looking solution on their own, or as part of a Smile Makeover or Full Mouth Rehabilitation. Veneers can be expensive; however, people are usually more than happy with their results and feel that the benefits far outweigh the cost. What Are Some of the Alternatives to Porcelain Veneers? While porcelain veneers are often the best choice for specific dental concerns, there are alternative treatments available that may also be of benefit. Cosmetic dental bonding is an option in some cases for patients who have teeth affected by chips and cracks. This treatment utilizes a strong composite resin to repair the tooth and improve its shape and appearance. The results typically do not last as long as a porcelain veneer; however, dental bonding has many advantages and can provide long-lasting outcomes with the proper care. For patients who would like to address yellowing and other forms of mild to moderate discoloration, teeth whitening may be able to successfully improve these issues. We offer both ZOOM® teeth whitening procedures and the innovative KöR Whitening Deep Bleaching™ System to enhance the appearance of teeth affected by deep stains. In some cases, a porcelain crown instead of a veneer may be the better choice. Crowns cover the entire tooth and are often the best option for teeth that are heavily damaged or decayed. They are custom-designed to provide excellent structural support, enhanced function, and an improved appearance. Once you are evaluated during the initial consultation, Dr. Fawcett can talk with you about porcelain veneers or other options that may be suitable for your needs and goals. Dr. Fawcett has many years of clinical training and hands-on experience and has been recognized for having the necessary skills to improve people’s smiles and impact their lives in a way many have only dreamed about! For more information about porcelain veneers, please contact the Fawcett Center for Dentistry, P.A. to set up an appointment with Dr. Fawcett.